Most of us are familiar with the Bible’s chronicle of the epic battle between David and Goliath. 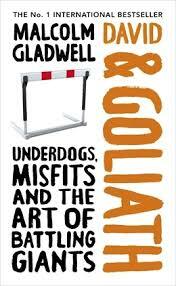 Malcolm Gladwell puts this title story to good use in his New York Times best-selling book David and Goliath, Underdogs, Misfits and the Art of Battling Giants. In example after example, he illustrates how disadvantages in life can strengthen us and oddly become advantages in the long run. He touches on stories like David and Goliath showing how an underdog often uses unexpected and unpredictable techniques and skills to overcome difficulties and launch themselves into unique greatness. He notes that people with difficulties are forced to be creative and innovative. There are more opportunities to think outside the box than what a more average, normal life might bring. I enjoyed this book immensely and fundamentally agree with the foundation of his thought process and research. If a disadvantaged person has the motivation and ability to push for resources to implement overcoming strategies with new, creative and innovative ideas – success skyrockets. For some, I believe a disadvantage is simply a disadvantage. Some do not and/or cannot capitalize on their disadvantages. What differentiates those who do and those who don’t? That question is not addressed in the book or in this research that is quoted. However, it does not take away from the delightful journey as Gladwell describes example after example of people who took their difficulty and turned it into something great. On a small scale, I can relate to this book personally as I know my own experience facing physical disability changed me for the better in many ways and affords me unique opportunities I would not encounter otherwise. The book reminded me to honor the blessing of the unique gift that dichotomously exists in my limitations. Incidentally, I have read other Gladwell New York Times bestsellers (The Tipping Point, Blink) and did not notice the Judeo-Christian influence evident in David and Goliath. 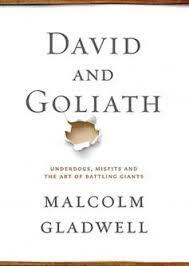 Apparently, Gladwell returned to his Christian faith while writing David and Goliath. There’s no possibility of being pessimistic when people are dependent on you for their only optimism. Courage is not something that you already have that makes you brave when the tough times start. Courage is what you earn when you’ve been through the tough times and you discover they aren’t so tough after all. The right question is whether we as a society need people who have emerged from some kind of trauma— and the answer is that we plainly do. This is not a pleasant fact to contemplate. For every remote miss who becomes stronger, there are countless near misses who are crushed by what they have been through. Unexpected freedom comes from having nothing to lose. When people in authority want the rest of us to behave, it matters— first and foremost— how they behave. This is called the “principle of legitimacy,” and legitimacy is based on three things. First of all, the people who are asked to obey authority have to feel like they have a voice— that if they speak up, they will be heard. Second, the law has to be predictable. There has to be a reasonable expectation that the rules tomorrow are going to be roughly the same as the rules today. And third, the authority has to be fair. It can’t treat one group differently from another. The powerful are not as powerful as they seem— nor the weak as weak. We spend a lot of time thinking about the ways that prestige and resources and belonging to elite institutions make us better off. We don’t spend enough time thinking about the ways in which those kinds of material advantages limit our options.